The sectional is here and yes I was crazy enough to clear out our entire living room (Christmas decor and all) to see what a sectional would look like within that space. My mom always said “oh I’d love a sectional in here” so I took her nagging as an incentive to just see what it would look like in our living room. Like I mentioned last week, American Signature furniture (in some areas known as Value City Furniture) sent me the Athens 6 Pc. 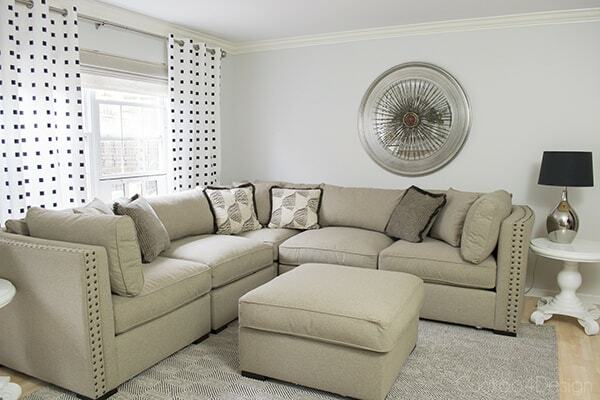 Sectional by Koehler which is from their new Empirical Comfort Line. 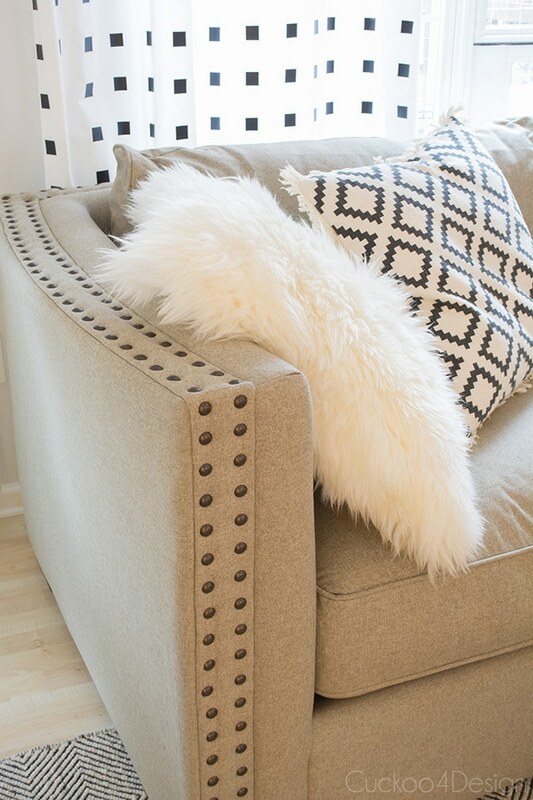 The sectional had me at nailhead trim. We didn’t get it for that purpose though, nope, we had been longing for a new sectional for our basement for a very very very long time because the other sectional that we had down there was awful and smelled bad from our male cat that died of kidney disease and had used it as a toilet on many occasions. Even though it was a leather sectional, it ended up just smelling bad and after 15 years it was really time to go. I have only blogged about our basement a view times and it’s time to finally give the man-cave a makeover. We need to rearrange furniture down there, fix molding and holes in the wall and purge a tad bit to make it work again. It’s also the place where I have my Etsy shop items and craft desk. I have am American Signature Furniture store very close to my house and have bought accessories from them before. I love walking through their store to see what they have. It’s an unexpected source for home accessories and they have more accessories in the store than online. The silver mirror above my couch and the silver lamps are actually from them too. 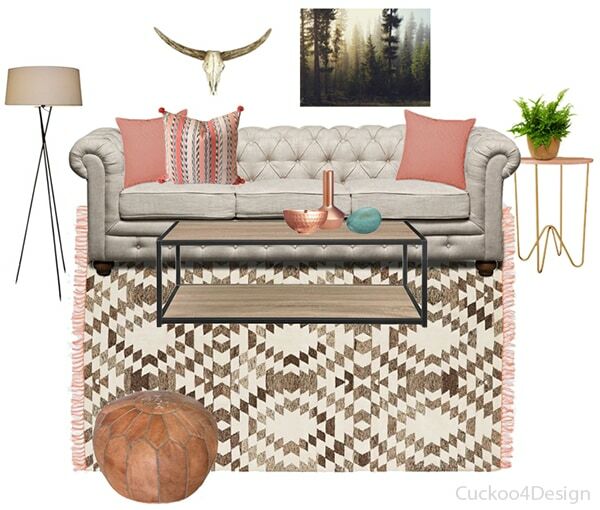 And if you remember, I included their Chesterfield sofa version in this moodboard that I did a while ago because I love it so much and it is affordable. I made the curtains myself and you can find the tutorial HERE. And this guy is happily testing out his new man-cave sofa. Sooooooo now we can’t wait to get it all down into the family room (UPDATE: We did it and it’s in the basement man-cave. Click HERE to see). There is a tad bit of a problem though because the corner pieces don’t fit through the basement door. The sofa fits through the stair case but not through the actual door. I’m on the hunt for an upholstery shop who can help me with that problem though. 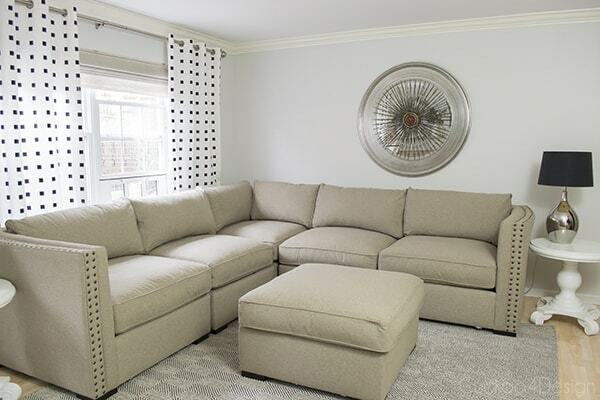 I had read in this article HERE how it is common practice to take sofas apart and put them back together in NYC to get them into apartments. Since there are plenty of small elevators and staircases in the city. There are lots of businesses who specialize in this in the big apple but apparently local upholsterers in our area aren’t too thrilled with a job like this. This company HERE sounds just like what I need. I might have found a guy though locally and am waiting for him to come over to take a look. So stay tuned. I hope you enjoy all the Christmas decorations and homes as much as I do. 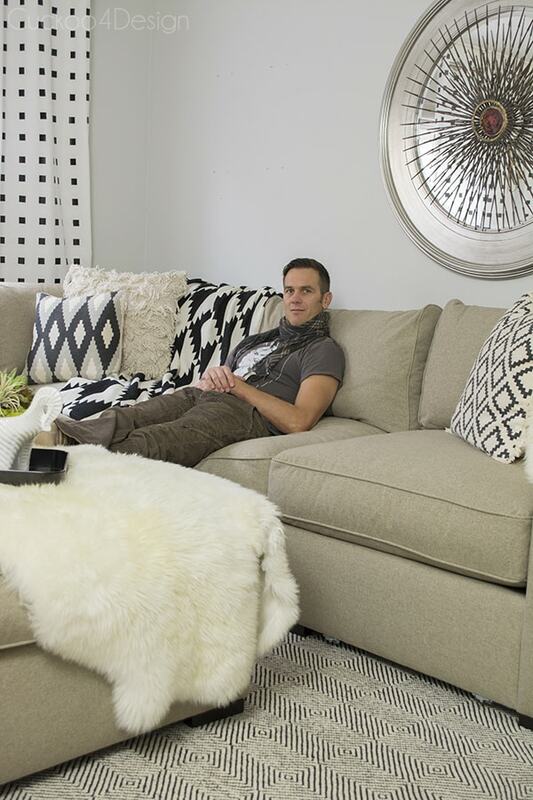 In case you missed my Blogger Styling Christmas Home tour, you can click HERE to see it. 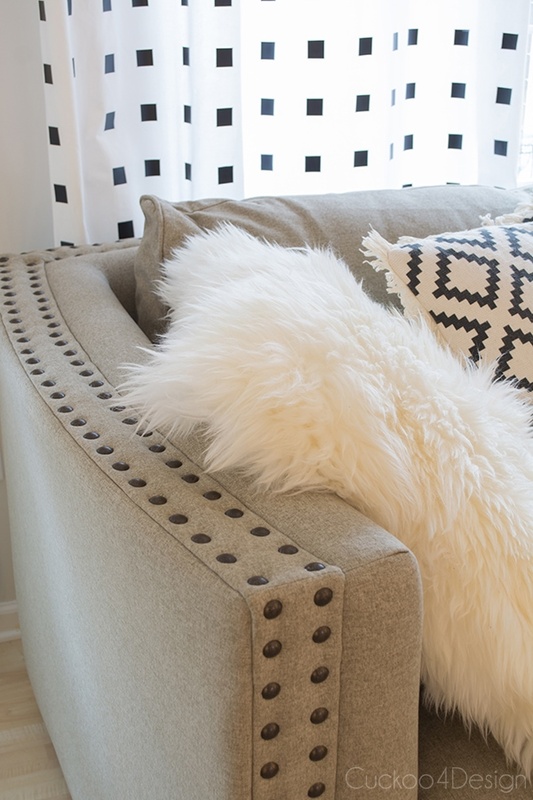 it looks so comfy and i love it paired with black and white! glad jarrid likes it! Your styling is so inspirational! 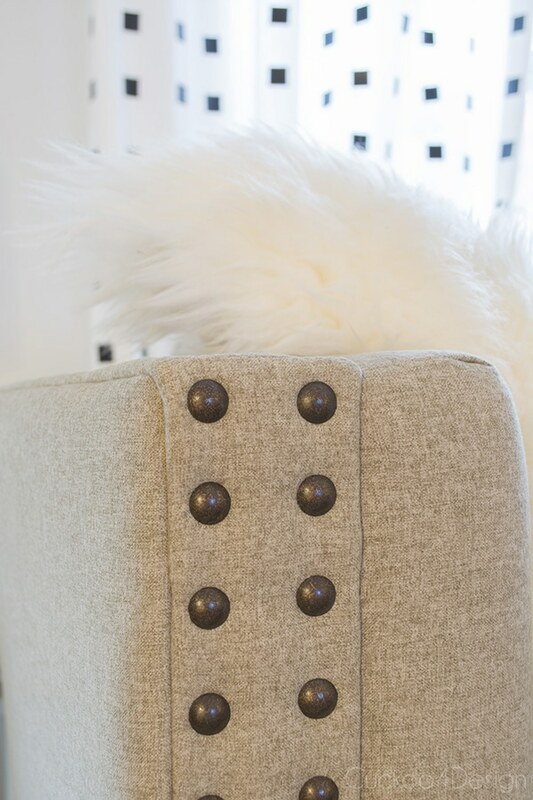 That nailhead trim is hot. Fingers crossed that someone will be able to get it downstairs for you! Oh so good to hear from you Kelly! The sofa doctor has gotten back to me already but I’m still hoping for a local person to help so nobody has to travel here from NYC lol. We have an American Signature store within a few miles from our apartment in Estero. In fact, that’s where we found our great apt. size dining table and chairs for $199! We have our eyes on a shelving piece for the future when we move into Shell Point to hold all our treasures. Wow, I can’t wait to see it in the basement. It looks so comfy. I’ve been looking at them for our living room and just can’t decide. It is super comfy. And it’s hard to pull the trigger on something like this for sure. What a beautiful piece! Ugh, I hope you can get it downstairs. Maybe it will just have to live there and move your other furniture downstairs?? I had to come by and check out “the sectional”. I think it looks pretty good in the living room! 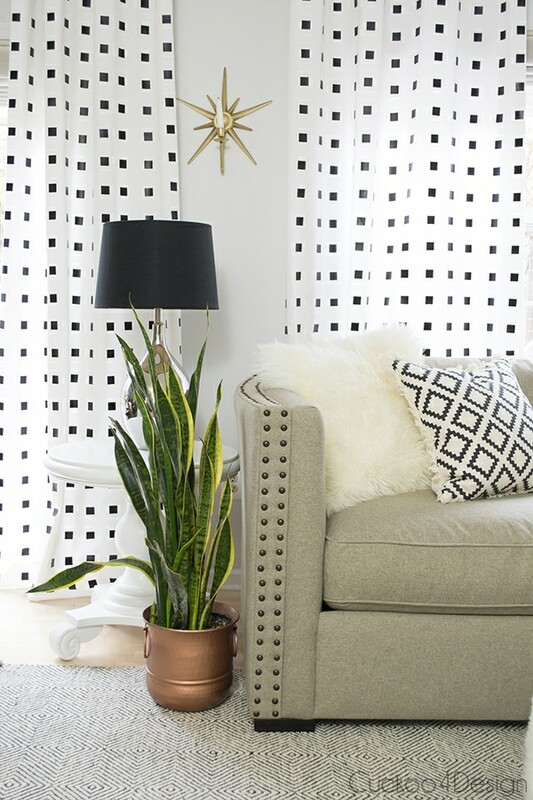 Such a pretty design and much better with your cool pillows! Good luck with quest to get it into the basement. Thanks Sarah, I already know that the couch doctor can help me but he’d have to come from NYC lol. ooh, looks great! that trim is amazing :). Good luck finding a way to get it into the basement! The sofa is fantastic, crossing my fingers you have a solution soon! Oh gosh I’m hoping so too. What a great sofa!! It looks amazing in the room! How fab, love it. I guess taking apart a basement window is not doable? Let us know how you manage this.?…. ?